Imagine you had a fairy godmother. A fun, fabulous, fashionable fairy godmother who spent her life collecting beautiful things. Imagine she said "Why don't you rifle through my closet and borrow something?" At Bell Street you'll find a treasure trove of vintage, handmade and secondhand clothing available to borrow for weddings, balls, graduations, costumes, bridesmaids, red carpet events, or any occasion you can think of. There are hundreds of dresses to choose from as well as pretty tops, formal skirts, and beautiful outerwear keep you warm. When sourcing garments I look out for genuine vintage pieces as well as classic, flattering styles. I have a strong preference for sequins & sparkles, textured fabrics and solid colours. Think of this as your shared wardrobe, to dip in and out of whenever you need. 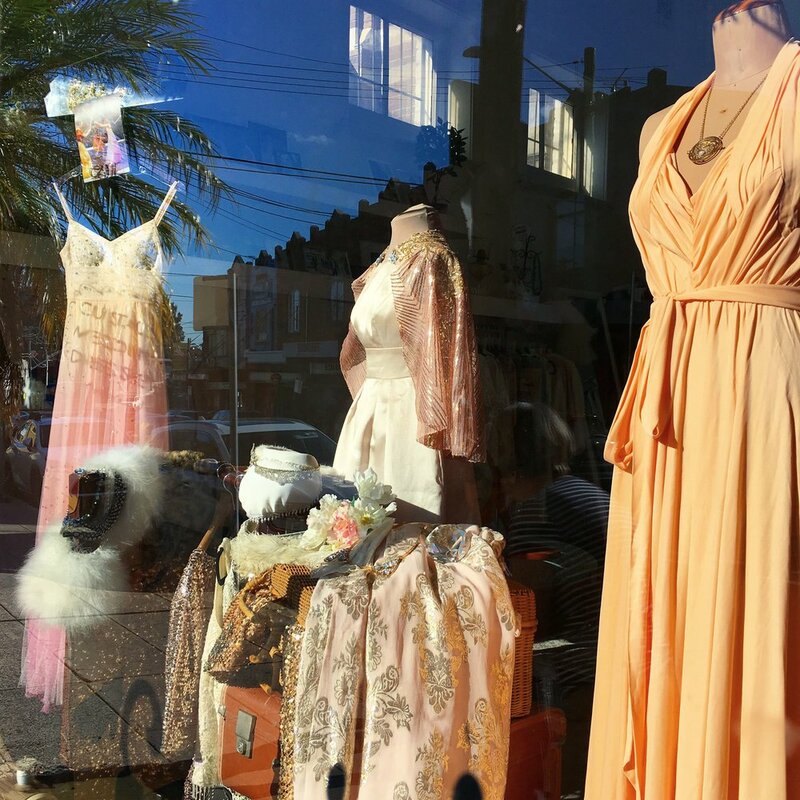 Visit the store at 391 Illawarra Road Marrickville, NSW, and try on as many things as you like in our spacious fitting room. We can alter most items to your size, make small changes and add embellishments if desired - all included in the price! Pay with credit card (we keep your details for security) and take your items home with you for a week - enjoy your event and take some photos for us! Bring everything back as is - we’ll take care of cleaning and any minor repairs. We also have a range of accessories in store which are free to borrow with any outfit. Looking for the collection? I’m in the middle of updating the website and have had to disable the old product archive for now. There are now over 800 items in store and uploading all their pictures takes time! So sit tight and check back soon, or, come in to the store and see for yourself! Borrow from Bell Street is a great sustainable fashion option for those who know they don't need any more clothes - but still love the thrill of wearing something new. Interested in borrowing an outfit for your own wedding? Good on you! We have an amazing range vintage and handmade wedding dresses and separates that can be mixed and matched into something new and perfect for you - a one-of-a-kind wedding look for a fraction of the price of a custom dress. The collection is made up of handmade samples using excess materials from my custom made business, generous donations from many fabulous fairy godmothers, and of course hours and hours of hunting through op shops and vintage stores. The idea is that uniqueness isn't exclusive and you don't have to pay thousands of dollars for a custom made dress you'll only wear once (but if you want to, go ahead! I know a GREAT dressmaker). Let's address the elephant in the room: why would someone spend thousands of dollars on a dress they'll only wear once? My answer is - you don't have to. You can, but you don't have to. You can wear whatever you like. Got that? Whatever you like. Your wedding is the one time where you set the dress code, and there is no such thing as being overdressed. Why not take the chance to wear something fun? After a few years of making custom wedding dresses, I learned that women want to wear something special on their wedding day, but everyone has different priorities - keeping things stress-free, affordable, sustainable, ethical, or all of the above. Borrow isn't about renting a used wedding gown from a catalogue. Borrow is about coming in and playing dress ups, styling vintage tops with handmade skirts, tweaking and crafting a look that completely suits you. You can borrow an entire outfit, or just parts of an outfit. You could borrow a skirt, and have a custom top made for you to keep. If you've already got your wedding dress and looking for something warm to wear in case it gets cold, I've got a whole range of cardigans, jackets, coats and shawls.